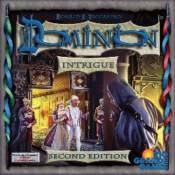 Rio Grande Games has updated Dominion: Intrigue in this Second Edition! In this new Second Edition, Rio Grande Games has removed 6 of the kingdom card sets from both the base game and Intrigue, and added 7 new card sets to each! Additionally, the rulebook has been rewritten for more clarity! The Trash card in the base game has been updated to a cardboard Trash mat!